Although September is now nearly halfway gone I didn't want to get to far into the month without sharing my favorites from the previous month. This has been such a fun series to do on the blog and is a great way for me to inform you of my go-to products and pieces for the previous month with hopes that you'll share yours with me as well. August definitely felt like a long month but that is probably due to the fact that I was at home, then at school, and also went on a quick trip during that time. 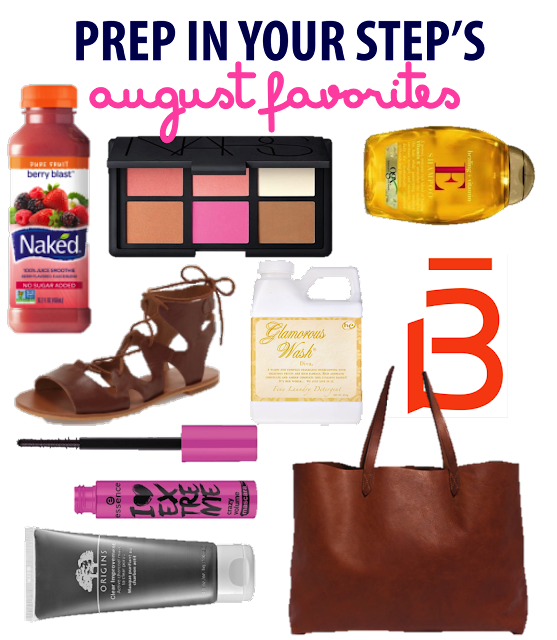 I'd love to hear your August favorites or anything you've been loving lately! Those sandals are just adorable!!! I've been thinking about asking for the East West Tote for Christmas! That NARS cheek palette is beautiful, I love that poppy pink blush! How do you use this detergent? We have it at a local boutique and I didn't know since it was so expensive if you add it in with something or what dryer sheets you would use? Love your blog, thanks so much!